A Preston-trained boxer is heading into the biggest fight of his life on Saturday night. 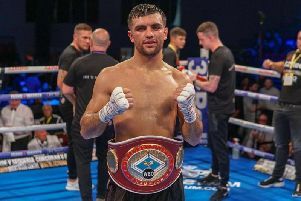 Liam Conroy will be a huge underdog when he takes on top prospect and Olympic medallist Joshua Buatsi for the vacant British light-heavyweight title at the Copper Box Arena in London. The Barrow fighter, 16-3-1, works with Preston trainer, manager and promoter Johnney Roye at MTK Manchester in Lostock Hall. 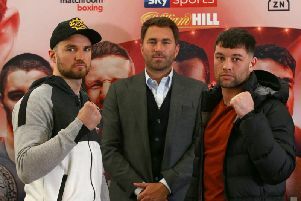 The pair are plotting a big upset this weekend, the former English champion having won his last five fights by stoppage, including at Preston Guild Hall 12 months ago when he saw off Miles Shinkwin in two rounds. Buatsi, who won bronze at the Rio Olympics in 2016, has raced to 9-0 as a professional with seven knockouts and is seen as a fighter destined for the very top. “This is a massive fight but I think it’s been a long time coming,” said Conroy. “I won my British title fight eliminator in 2017 and I’ve just been working relentlessly since. “This has always been my goal. “It’s not about the opponent, it’s about my journey and the British title is my dream so I’m going to give it everything that I can and keep on going relentlessly till the final bell. I won’t stop until I have that belt. “Like I say, it wasn’t about the opponent, it was about the title and I think no matter who the opponent was I would have taken the fight. “People seem to think that I’ve been given something here, being in this fight, but I haven’t been given anything. Buatsi, 25, sees Conroy as simply another step on his path towards world titles. “It’s a title that I want to win, it’s part of the journey that I’m taking,” he said. “Conroy is the man that’s been put forward and on March 23 it’s going to happen. Having seen off his last three opponents in the first round, Buatsi has rubbished suggestions that he might struggle with the 12-round championship distance. “They might think that I’ve only done three one rounders but that’s cool,” said the Croydon puncher. “I’ll be prepared, I’ll be there from one to 12 so whichever number it is, if I see the opening I’ll take it. In the main event of the Sky Sports-televised Matchroom Boxing bill, Charlie Edwards make the first defence of his WBC World flyweight title against Spain’s Angel Moreno. London Cruiserweight rivals Lawrence Okolie and Wadi Camacho collide with the British and Commonwealth titles on the line.